Most carrageenan is extracted from Kappaphycus alvarezii and Eucheuma denticulatum. The original source of carrageenan was Chondrus crispus, and this is still used to a limited extent. Betaphycus gelatinum is used for a particular type of carrageenan. Some South American species that have previously been used to a limited extent are now gaining favour with carrageenan producers as they look for more diversification in the species available to them and the types of carrageenan that can be extracted. Gigartina skottsbergii, Sarcothalia crispata and Mazzaella laminaroides are currently the most valuable species, all collected from natural resources in Chile. 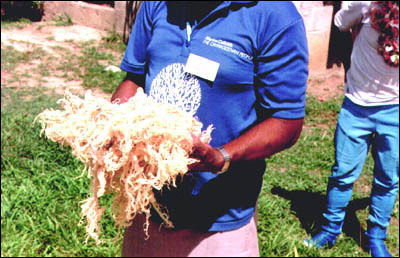 Small quantities of Gigartina canaliculata are harvested in Mexico. Hypnea musciformis has been used in Brazil. Over the last few years most of these seaweeds have been reclassified by marine biologists as they gain more knowledge of their structure. If readers are to go beyond this publication for further information, they need to be familiar with the both the old and new names, as listed below. Betaphycus gelatinum was Eucheuma gelatinae. Chondrus crispus remains unchanged, and is commonly known as "Irish Moss." Eucheuma cottonii is now Kappaphycus alvarezii, and commercially was and is called "cottonii". Eucheuma denticulatum was Eucheuma spinosum and commercially was and is called "spinosum". Eucheuma gelatinae is now Betaphycus gelatinum. Eucheuma spinosum is now Eucheuma denticulatum and commercially was and is called "spinosum". Gigartina stellata, mentioned in earlier articles but now not so important, is now Mastocarpus stellatus. Iridaea ciliata is now Sarcothalia crispata. Iridaea laminaroides is now Mazzaella laminaroides. Kappaphycus alvarezii was Eucheuma cottonii and commercially was and is called "cottonii". Mazzaella laminaroides was Iridaea laminaroides. Mastocarpus stellatus was Gigartina stellata, mentioned in earlier articles but now not so important. Sarcothalia crispata was Iridaea ciliata. The definitions of the vertical zones of the shore, littoral fringe, eulittoral and sublittoral were given in Section 2.2. Kappaphycus alvarezii (Figures 33 and 34) is found in the upper part of the sublittoral zone, from just below the low tide line, of reef areas on sandy-corally to rocky substrates where water flow is slow to moderate. Eucheuma denticulatum thrives on sandy-corally to rocky substrates in areas constantly exposed to moderate to strong water currents. 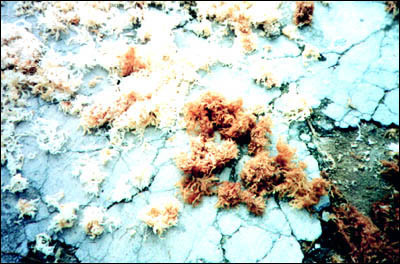 Betaphycus gelatinum (Figure 35) grows on rocky, coralline substrates, a few metres from the reef-edge, where it is exposed to strong wave action and turbulence. Betaphycus gelatinum drying (Hainan Island, China). All three require water temperatures of 21°C or more and they thrive in bright light. Chondrus crispus (Figure 36) grows from the littoral fringe to 20 m below mean low water, depending on the wave motion, transparency and rocky structures available. Usually it is most abundant from mean low water to the mid-sublittoral zone. It grows best on stable rock ledges and large boulders, preferring horizontal shelves, growing not so well on smaller rocks or sediment-covered rocks. Strongest growth is in late spring and summer; least growth is in winter. Gigartina skottsbergii (Figure 37) grows in the sublittoral at depths of 9-15 m. It grows best in the summer. Sarcothalia crispata is found from the eulittoral to the sublittoral, down to a depth of 10 m.
Mazzaella laminaroides grows in the eulittoral zone on wave-exposed sites, also in estuaries. Where people collect intertidal gastropods (potential algal grazers), the growth of Mazzaella laminaroides flourishes. Gigartina canaliculata and Hypnea musciformis grow in the eulittoral zone. Chondrus crispus. (after Hansen, Packard and Doyle, 1981). Kappaphycus alvarezii and Eucheuma denticulatum were originally harvested from natural stocks growing in Indonesia and the Philippines. In the 1970s, cultivation began in both countries and this now supplies most of these species, with only small quantities being collected from the wild. Cultivation has spread to other countries, most successfully in Tanzania (Zanzibar), Viet Nam and some of the Pacific Islands, such as those of Kiribati. Wild Betaphycus gelatinum is harvested mainly in Hainan Island, China, Taiwan Province of China and the Philippines, and it is cultivated on Hainan Island. 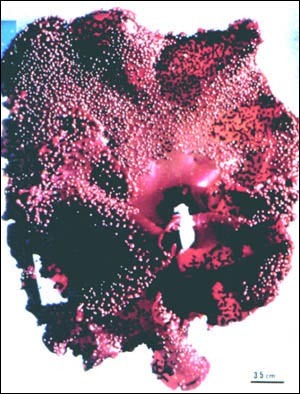 Chondrus crispus is harvested for carrageenan production in Canada (Nova Scotia and Prince Edward Island), United States of America (Maine and Massachusetts) and France. Gigartina skottsbergii, Sarcothalia crispata and Mazzaella laminaroides are all harvested from natural resources in Chile, mainly central Chile from Valparaiso to Chiloe Island. Some Gigartina skottsbergii is also harvested in Argentina. Gigartina canaliculata is harvested in Mexico (Baja California), and is available from south of Ensenada to Punta San Antonio. Hypnea musciformis occurs along most of the coastline of Brazil, but production is erratic in both space and time, increasing the costs of harvesting. The industry needs about 13 percent of the dry seaweed used annually for production of carrageenan as temperate-water Gigartina-like species. These contain lambda carrageenan and a "weak" kappa; the properties of the latter lie between those of a normal kappa (such as obtained from Kappaphycus alvarezii) and iota carrageenan. While 1 000-2 000 tonnes come from older sources, such as France and Canada, over 90 percent today comes from Chile. None of the carrageenophytes from Chile is currently cultivated, all come from natural regrowth. Nevertheless there seems to be no evidence of overharvesting and there are areas for expanding the harvest of the most important species, Gigartina skottsbergii. This seaweed grows from Puerto Montt to Puenta Avenas. While fishermen are not currently available to harvest along this coastline, an increase in demand would probably stimulate the population shift needed to meet the increase (H.R. "Pete" Bixler, 2002, pers. comm.). Chondrus crispus has been harvested in Canada since the 1920s, but only came to prominence during the Second World War, when access to Japanese agar stopped and the Irish Moss beds in France also became inaccessible. Production on Prince Edward Island jumped from 5 dry tonnes in 1940 to 900 dry tonnes in 1942. The original collection was from storm tossed seaweed, driven onto the shore by strong winds. Local farmers picked it up from beaches and shores and sometimes waded into the surf with horse-drawn scoops to capture unattached moss. Fishermen took their boats offshore with hand rakes and scrapped the moss from the flat rock shelf where it grew. In the 1970s, large lobster boats equipped with drag rakes and winches were introduced; the steel rakes - about 1 m wide, 25 kg, with about 40 teeth - are dragged across the moss beds. The scale of operation of these boats had a rather severe effect on the regrowth of the beds and perhaps it was fortunate that demand for moss declined sharply as the cultivated Kappaphycus and Eucheuma became available from the Philippines in the 1980s. With a low demand from carrageenan processors, Irish Moss harvesting has returned to being a part-time fishery, where there is a place for operators equipped with small boats, outboard motors and hand rakes. For further details of Chondrus crispus harvesting in Canada, with very good illustrations of equipment and operations, see Pringle and Mathieson (1986). Chondrus crispus in France grows mainly around Brittany. However, there are no flat beds, as found in Canada, so the use of dredgers is not possible, only manual gathering. Harvesting is a part-time operation by about 3 000 people, although this number and the harvest are both falling as the living standards of the harvesters rise. Betaphycus gelatinum on Hainan Island, China, is most abundant about 1 m below the low tide mark and was collected by hand, but cultivation has overtaken this practice. Gigartina canaliculata grows in the eulittoral zone in Mexico and is harvested from May to September by fishermen, who pull it by hand during low tide. Mazzaella laminaroides is harvested from the eulittoral zone by people walking around the rocks at low tide and pulling the seaweed from the rocks by hand. Sarcothalia crispata is harvested from the sublittoral zone by fishermen who dive and use hooks to drag the seaweed off the rock and store it in bags called chinguillos while they work. Gigartina skottsbergii is harvested from the lower sublittoral zone in the same way as Sarcothalia crispata. Depending on the area where they dive, each fisherman is able to harvest about 70 kg/hour from a natural bed. Kappaphycus and Eucheuma are both cultivated by the same methods, the two most popular being the fixed, off-bottom line method and the floating raft method. The basics of the fixed, off-bottom line method are simple. First choose a suitable site, then drive two wooden stakes, about 5-10 m apart, into the bottom. Stretch either a monofilament nylon line or a polypropylene rope between the stakes; the line should be 20-30 cm above the sea bottom and the water must be deep enough to ensure that the seaweed is not exposed at low tide. Small pieces of seaweed (50-100 g) are tied to the line. Many of these lines are constructed, usually 1 m apart (Figure 38). If the site is suitable and farming maintenance is carried out regularly, the seaweed should reach 10 times its original size in 6-8 weeks, when it can be harvested. It is sun dried away from sand and dirt, then packed into bales ready for shipping. The main factor determining success or failure is choosing a suitable site. If Kappaphycus or Eucheuma is growing naturally, the place is probably suitable. If not, the following criteria apply. Reefs, well away from any freshwater sources (small rivers, etc. ), have proven to be good sites. If the seawater salinity (usually 35 parts of salt per 1 000 parts of water (parts per thousand = ppt)) falls below 30 ppt, the seaweed does not grow well. Water temperature should be 25-30°C; in shallow water near the beach, the water temperature may become too high during the day; a good site is between the low tide limit and the reef edge. The seaweed obtains its nutrients for growth from the water so water movement through the seaweed is important. Moderate water movement is preferable; this also helps to stabilize water temperature and salinity. If the current is too strong it can cause pieces of the growing plant to break off and be lost; wave action must be avoided for the same reason. The sea bottom type is important; a white, firm bottom with a limited amount of natural seaweed is good, too much seaweed or sea grass will compete for nutrients with the cultivated seaweed. Silt or mud on the bottom indicates possible poor water flow and if the silt is disturbed it may settle on the plants; muddy water will also reduce the light available to the seaweed. Plenty of sunlight is necessary for good growth; seaweed planted in shallow water (30-50 cm) grows well; in deeper water (more than 1 m) the light is reduced and growth is poor. Water depth is also important for farming: 0.5-1.0 m depth at low tide is good for the seaweed and allows the farmer to carry out maintenance more easily. Regular maintenance is essential. It consists of removing other seaweeds growing either on the lines or the crop itself, removing poorly growing plants, replacing lost plants, and making any necessary repairs to the stakes and lines. 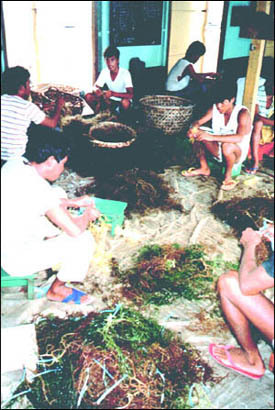 Kappaphycus alvarezii cultivation using fixed, off-bottom lines (Kiuva, Fiji). Once a site has been chosen, a trial is made using the chosen species. A few lines are set out at each of several different parts of the site, small pieces of the seaweed are attached and their growth rate is monitored weekly. If after 2-3 months the daily growth rate is 3-5 percent, the site is probably suitable and a small farm can be established. Because of the larger capital outlay required for large installations, before venturing into large farms it is advisable to monitor conditions for a full year so that the effects of all weather and other ecological factors are known. Small family farms have been the most successful, partly because there is more incentive to provide the necessary care and maintenance to the farm they own rather than one owned by an employer. Various problems can arise. Grazing fish can damage the crop. Siganids (rabbitfish) and puffers are common pests. Siganids are the most destructive, especially if the plants are all small: the entire crop can be devoured and even dense beds can be severely damaged. There is no simple solution except to move to another site where they are not prevalent. Turtles pose a special problem: they obviously take large bites but they also crawl through a farm, causing devastating physical damage. Long-spined sea urchins are also a pest, and can cause injury to the farmer as they try to remove them. The most common symptom of bad health is ice-ice, so named because of the white segments that appear on the plants, causing them to break at that point. There is some disagreement about its cause: some say it is a symptom of a bacterial or viral infection, others attribute it to physical stress caused by changes in the environment in which it is growing. Storms lead to strong water movement that can cause plants to break apart and even cause physical damage to the lines and stakes. So localities that are subject to seasonal cyclones, etc., should be avoided, or precautions taken during the periods - usually about 3 months of the year - when bad weather can be expected. The materials required include the wooden stakes used to hold the lines, which can be made from mangrove timbers or any other timber that can withstand immersion in seawater for at least a year; they need to be 5-10 cm diameter, sharpened at one end (Figure 39) and driven into the bottom until held very firmly. Monofilament nylon line with a breaking strain of 90 kg (200 lb) is used to support the seaweed, or 3 mm diameter polypropylene rope. The rope has an advantage in that the string used to tie the seaweed to the line can actually be inserted through the twist of the rope, ensuring it does not slide along the rope. 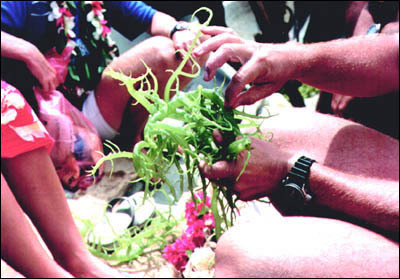 The seaweed is tied to the line with a soft synthetic string, often called a "tie-tie", preferably using a slip knot so that the seaweed can be easily removed at harvest time. The seedlings, 50-150 g pieces obtained from the last harvest or the nearest farm, are prepared by fixing the tie-ties to them (Figure 40), ensuring that they are kept moist all the time that they are not in the water. Seedlings and tie-ties are then fixed to the ropes at 20-25 cm intervals (Figure 38), the ropes can already be in the water attached to the stakes or it can be done on the land and the ropes then stretched between the stakes. At harvest time, the whole plant is removed and new seedlings are cut from the tips. Stakes from mangrove trees for use with fixed, off-bottom lines. Fixing "tie-ties" to seedlings, using 20-25 cm pieces of blue plastic raffia. To maintain the value of the crop, careful post-harvest treatment is necessary. It must be kept away from sand and dirt, so drying racks or mats are used (Figure 41). In some areas, the entire line is removed from the sea and hung over a tall "fence" to allow drying, the seaweed being untied after it has dried. In most areas, sun drying for about 2-3 days is sufficient to reduce the moisture content to the required 35 percent level. With practice, farmers can estimate the moisture level by feeling the seaweed, by its firmness and how it bends. If the moisture is above 40 percent the seaweed may rot during storage and transport; below 35 percent the seaweed becomes too firm and bouncy and it is difficult to compress it into bales. During drying, white salt-like crystals appear on the outside of the seaweed; any that are loose and can be shaken off are removed. Buyers do not like damp seaweed, nor foreign matter such as sand, dirt, stones, coral pieces or excessive salt. Some less scrupulous farmers have been known to add salt to the dried product since they are paid by weight and salt is cheaper than seaweed. 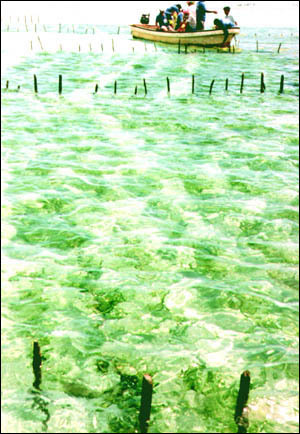 The second method of cultivation is the floating raft method. This is suitable in protected areas where water current is weak or where the water is too deep for fixed bottom lines. The selected areas must meet the criteria previously described, at least as they apply to this situation, and trials should be conducted in the same way. A white, silt-free bottom is not necessary. A floating construction is used to suspend the seaweed about 50 cm below the surface. Often a 3×3 m square timber frame, made from bamboo or mangrove timber, is used with 3 mm polypropylene ropes stretched parallel in one direction between the timbers, at 10-15 cm intervals (Figure 42). The seedlings are tied to the ropes and the raft is anchored to the bottom. The anchor ropes may need to hold the raft below the surface at the beginning, but as the plants grow and add weight to the raft, it may need extra support (such as polystyrene foam boxes tied to the corners of the raft) to prevent it sinking too low in the water. The seedlings can be tied to the raft on land and the raft towed into position. Regular maintenance during growth is still required. At harvest time the entire raft can be removed and used as a drying rack by suspending it between four corner supports, such as large drums. A raft for use in the floating-raft method of cultivation. 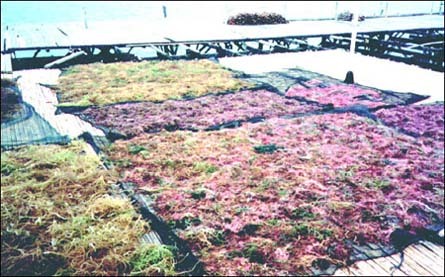 The off-bottom line farming method allows easier access since the farmer can walk around the lines at low tide, but the floating rafts have the advantage that they can be easily moved to another position if necessary, and removed from the water altogether in bad weather, thus avoiding destruction by heavy seas and strong winds. Methods and illustrations can be found in Trono (1993) and its associated CD-ROM, Critchley and Ohno (1997). For a thorough discussion of cultivation and some of its associated problems see Doty (1986), who also examines some of the costs and returns from farming. Very practical guides to Eucheuma and Kappaphycus cultivation, with useful illustrations, can be found in Foscarini and Prakash (1990) or Ask (1999). How much will it cost to start seaweed farming? How can I organize my work at the farm? What should I do to maintain my farm? How much will I earn from my seaweed farm? Copies are available upon request from the FAO David Lubin Library (see reference for details). Ask (1999) is similar, and copies may be available from the author (see references). Similar guides may be available from other carrageenan producers, listed in Section 7.2. In Viet Nam, Kappaphycus is being cultivated in offshore areas using floating rafts, in lagoons and inlets using fixed off-bottom monolines, and it is the only country to date that has also used ponds for Kappaphycus. 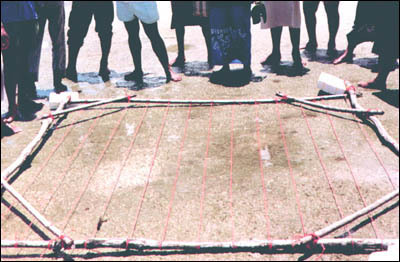 Fixed off-bottom monolines and fixed off-bottom nets have been used in ponds with muddy bottoms, while broadcasting seedlings directly onto the bottom is used where the bottom is sandy or coralline. Sometimes the ponds are used for seaweed for six months and then rotated with shrimp for six months. Betaphycus gelatinum is cultivated on Hainan Island, China. Pieces of wild seaweed are fastened to coral branches with rubber rings and thrown onto sublittoral reefs, where divers rearrange them. Some long-line cultivation has also been used. 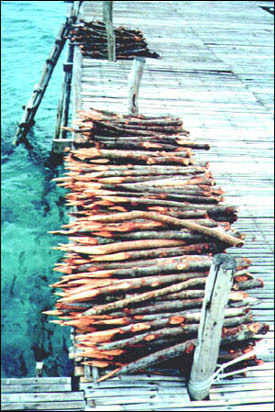 In France, one company cultivated Chondrus crispus in raceways and found it an economic proposition from 1978 to 1996. Its success was related to the selection of a fast-growing strain and an automated system that together produced a growth rate ten times faster than the natural rate. However, by 1996, the cost of wild C. crispus had fallen and the operation was no longer considered economic. Methods for the cultivation and restocking of Gigartina skottsbergii have resulted from collaboration between the Division of Aquaculture, Instituto de Fomento Pesquero, and the Department of Oceanography, Universidad de Concepción, Chile, and have been published as Romo, Ávila and Candia (2001). Cultivation methods for Sarcothalia crispata are being developed. About 120 000 dry tonne/year is harvested of Kappaphycus alvarezii, mainly from the Philippines, Indonesia and Tanzania (Zanzibar). For Eucheuma denticulatum, the harvest is around 30 000 dry tonne/year, again mainly from the same countries. About 300 dry tonne/year of Betaphycus gelatinum is harvested yearly from Hainan Island, mainly from cultivation. Until the early 1970s, Chondrus crispus was the main source of carrageenan and Canada provided about 70 percent of the world production. By 1992, with the success of cultivation of K. alvarezii and E. denticulatum, the demand for C. crispus had fallen to 3.8 percent of the total requirement for carrageenophytes, and of this, Canada supplied only 12 percent. In 1992, only about 7 000 wet tonnes was harvested, compared with the peak production of 50 000 wet tonnes in 1974. In France, there has also been a decline in harvesting, from about 6 000 wet tonnes in 1975 to about 3 000 wet tonnes in 1996. The Gigartina skottsbergii harvest in Chile was 30 100 wet tonnes in 2000. The Gigartina canaliculata in Mexico has fallen from a maximum production of 1 100 dry tonnes in 1978 to 200 dry tonnes, and it is all exported. Small quantities of other species are collected from Mexico, Morocco and Peru. Table 7 summarizes estimates of harvests of carrageenophytes, all in dry tonness. Marketing channel for seaweed - Indonesia (Burges Watson, 1999). For Kappaphycus and Eucheuma, the farmers usually sell to middlemen; sometimes there may be two in the chain. They sort and clean up the seaweed before selling it on to the carrageenan processors. The middlemen frequently help to finance the farmers with loans for equipment and seedlings. As cultivation in the Philippines has developed, some of the major processors have set up extraction factories there, eliminating the former transport costs to Europe. Two distinct grades of carrageenan are produced: refined and semi-refined. Large quantities of seaweed produced in the Philippines are now processed there, producing all grades of carrageenan. In Indonesia, again, there are active middlemen and a few local companies making semi-refined carrageenan (SRC). Figure 43 shows the marketing chain for Kappaphycus in Indonesia, and this is also typical of the situation in other countries, such as the Philippines. A large proportion of the seaweed is exported to Japan and the Republic of Korea. In Zanzibar (Tanzania) all the production is exported, mainly to the companies who helped to establish the industry. Pacific nations such as Kiribati have a transport cost problem but have entered into contracts with at least one major producer who is willing to pay a fixed price if the supply is assured. The farmgate price of these seaweeds has undergone severe fluctuations in the past, with boom and bust cycles that are harmful to both buyer and seller in the long term. Fixed price contracts assure the farmers of a steady income, otherwise when the farm gate price falls too low they simply abandon seaweed farming and return to fishing and other activities that sustain a subsistence living. This eventually leads to a shortage, a demand that cannot be met, giving rise to increased prices. In Chile there is large internal consumption by four processors; the remainder is exported through several intermediary companies. A useful review of trends of seaweed production in Chile includes a diagram showing the marketing channels within Chile (Norambuena, 1996). All the Betaphycus gelatinum produced in China is used there. In France, all Chondrus harvested is used locally. Canadians operate fishermens' cooperatives that sell Chondrus to FMC Biopolymer, based in nearby Maine, and also export to Europe. Demand for carrageenan has risen at a steady rate of about 5 percent annually, and this should continue for several years as a continuing increase in demand is forecast. Carrageenan extractors actively pursue a policy of assistance to those interested in establishing seaweed farms, so future prospects for the industry are very encouraging.